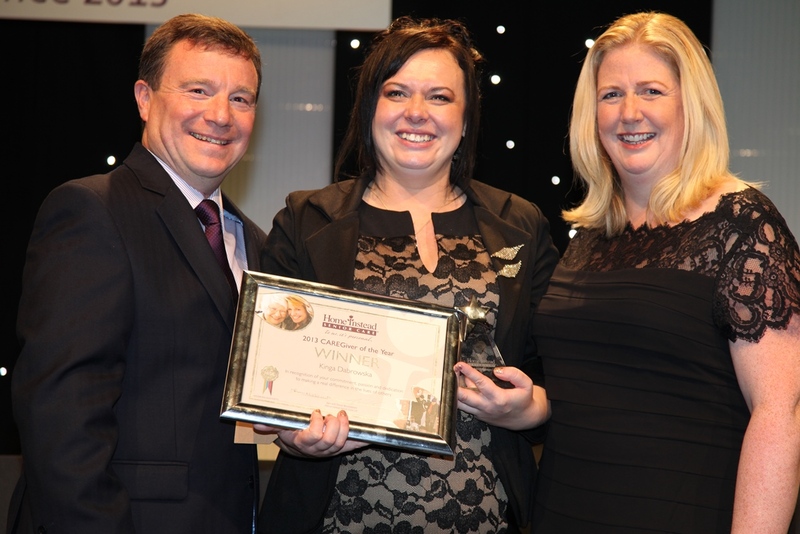 Caring Kinga is the UK’s CAREGiver of the year! Home Instead Senior Care is delighted to announce that Kinga Dabrowska, has been awarded the prestigious national title of ‘Caregiver of the Year’. Kinga, who is from the Swindon & the Vale of the White Horse office won the award for the unswerving care and commitment she has shown to her elderly clients. Home Instead employs in the region of 7,000 caregivers across the UK, and to win the overall accolade is a fantastic achievement. Kinga (33), who lives in Swindon, joined the team a year ago and was nominated for the award by Home Instead owner John Kirk. John attended the glittering national ceremony which was held at the ACC in Liverpool with Kinga and was immensely proud to see her collect her award in front of over 500 guests. John explained, “From our very first meeting it was clear that Kinga had a real caring heart and a passion to make a difference to people. She has supported her clients in an exemplary fashion and has become a much-loved companion to her clients and a well-respected member of the team. As part of Home Instead’s care services, Kinga provides care in her client’s own homes such as companionship, meal preparation and medication reminders.